Team @BarbieStyle or Team @OfficialKen? When it comes to social media marketing, do you have a favorite campaign so far in 2011? During 2011, the toy giant Mattel’s internal marketing staff partnered with Ketchum Public Relations to execute a fabulously fun and engaging integrated marketing campaign between mid-January and February 14 that contained multiple social components, including the use of Twitter, Facebook and YouTube accounts by the inanimate, non-real, non-human Barbie and Ken doll characters. 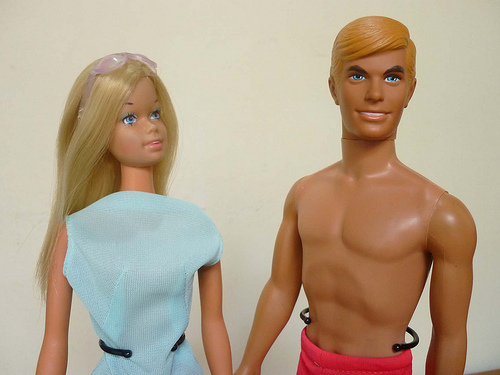 The campaign’s central messaging centered around the idea of the fictional Ken doll’s 2011 New Year’s resolution to win the fictional Barbie doll back, after having lost her love on Valentine’s Day in 2004. Check out this YouTube video, which was a one of the social components of the campaign, and read the Mashable business article, “How Barbie & Ken Were Reunited by Social Media” to learn more. The reason why this campaign makes my favorite social media marketing campaign list is because of the blatant statement the campaign sent to America about the significance of social media marketing today. Let’s face it… if two of American children’s most beloved toys, the Barbie and Ken dolls, are involved in social media, then aren’t we all? At the least, Mattel’s campaign revealed that social media channels are almost inescapable by our youth today. So, what do you think about the impact of social media marketing on our society today? And, if you had to pick a side, whose team would you join? Team Barbie or Team Ken? « Are You a Foodie?